From the kitchen of One Perfect Bite...I love the taste and flavor of pork, as well as the ease with which it can be prepared. Chops and tenderloins are perfectly sized for today's smaller families and even the larger loins can be cut to prevent endless leftovers. Pork is also inexpensive. Our warehouse store sells large single loins for about $2 a pound. Most of the loins weigh 8 to 9 pounds each and can be cut into meal size portions that are more appropriate for today's families. I usually divide these loins into thirds and freeze them for later use as whim dictates. Unfortunately, I usually spend the money I save buying meat this way on ingredients with which to sauce it. When I prepare a loin for roasting, I tie the meat into a cylinder of uniform size and brown it before roasting. I cook my pork loin to an internal temperature of 140 degrees. When I take it out of the oven, I tent it in foil and let it sit for another 15 minutes. The roast continues to cook and at the end of the rest period it will reach 150 - 155 degrees, a perfect temperature for pork. I've been experimenting with cranberries lately and I wanted to use them to make a glaze that could be used for pork or chicken. I finally have come up with one I think is acceptable and a somewhat different than standard fare. It is a bit pricey, but it is wonderfully flavorful and will give your palate a joyful jolt. I've left the berries whole for the photograph, but the sauce can be strained and you may actually prefer to use it that way. Here's the recipe for cranberry glazed roast pork. 1) To prepare glaze: Combine cranberries, ginger, sugar, orange zest and orange and cranberry juices in a saucepan. Bring to a boil over high heat, stirring occasionally. Reduce heat and cook until cranberries burst and sauce thickens, about 5 to 10 minutes. If you wish, strain through a fine mesh sieve and allow to cool. When cool add orange liqueur. 2) To prepare roast: Preheat oven to 325 degrees. Using kitchen twine, tie roast at 1-inch intervals to form a cylinder of uniform circumference. Rub all surface of roast with 1 teaspoon olive oil. Rub cylinder with all of salt pepper and marjoram. Heat remaining 1 tablespoon oil in a large, heavy ovenproof skillet. Add pork and sear all surfaces well. Brush pork with glaze. Transfer skillet to oven and bake for 15 minutes. Brush again with glaze and cook for another 20 minutes, or until pork reaches an internal temperature of 140 degrees. Remove from oven. Brush again with glaze, tent with foil and let rest for 15 minutes before slicing. Yield: 6 servings. Maple Rosemary Glazed Pork - What's Cookin, Chicago? Our son is allergic to poultry, so every year I cook a turkey for everyone else and some other sort of roast for him. He really likes port, and I'll often do something with a pork loin roast - this would be really special. I can only imagine the great flavor pairing between the pork and the cranberry--delicious! And a wonderful, different alternative to the ubiquitous Christmas turkey here in France! This is very festive looking. I've never cooked a pork roast, shame on me! I just like to eat them at friend's houses! Your glaze looks yummy and so perfect for this time of the year . . . or in January to use up the last of the cranberries! That looked very festive! Love the color of the glaze on the roast, am sure it was very delicious! So lovely! I think I have everything I need to make this. This will make a stunning dinner tonight! Thanks for a wonderful recipe! A timely recipe! I have a pork loin (portion) defrosting right now. I'll only need to pick up some cranberry juice. I try to extend our cranberry enjoyment as far as possible when they are in season. I prepared your chicken skillet recipe (posted last week) for my family. We all loved it. What a great idea Mary. I adore cranberries and always freeze some for use later in the year. Your cranberry glaze is to my liking - not too sweet and I think the addition of the orange liqueur would bring a lot to the table. This pork would be spectacular for Christmas dinner. This looks delicious Mary and I've been keeping an eye out for recipes using cranberries. Our local markets regularly put loins on sale for $2, and I buy one then carve into thin and thick chops, and a couple of small roasts, one of which is in the freezer awaiting this recipe. That looks like a beautiful holiday pork roast. I love cranberry on anything. That is a wonderful flavor combination. I bet this pork roast is quite tasty! Plus it's quite good in this holiday season! I love pork...and with a cranberry glaze, I just know it's going to be amazing! This looks so delicious! It would be great at a Christmas dinner! Mary, this looks beautiful and absolutely perfect for a special occasion. The cranberry glaze topping sounds so wonderful. Mary, The pic of the pork looks sooooooo yummy. It made me very hungry. It looks and sounds delicious. I can't wait to try this recipe, probably this week. Thanks for sharing. How pretty is that? I never think of using marjoram but it's just perfect with the pork. Oh gosh we just had a pork roast last night. This sounds yummy. I love pork loin and I purchase it in bulk like you do and I divide it up for future meals. This looks really good. I once had a cherry-topped pork loin and this looks similar. What a perfect roast for a holiday dinner. I have a recipe similar to yours from the "Frugal Gourmet" do you remember him! His name was Jeff Smith - that's a blast from the past. Like you I love pork with a glaze or flavor! Sometimes I'll even use jam! Have a great day. Your internal temperature judgment is spot on. A whole roast for only two of us would yield to much by way of leftovers. But you're right, just cut it into suitably sized pieces and freeze what you don't use immediately. I love the cranberry glaze idea. Cranberries and pork, fabulous combination, looks fantastic! 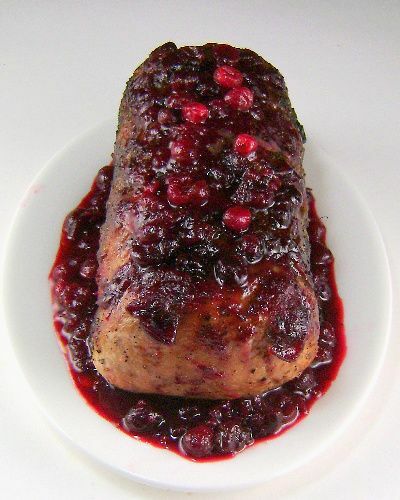 I love fruit with pork so I am certain to love this cranberry glazed pork roast. It looks lovely Mary. Cranberries and orange liquor on pork...what a feast. My Mom this year is actually thinking of changing up our traditional Christmas lunch. One of her selections was pork roast ;o) I'll send her your recipe. Woww wat a festive food.. If I had the ingredients I would make this for dinner tonight. I love anything cranberry and the pork would be delicious with it. My mom adores cranberries and pork roast...what a wonderful holiday treat this would be for her. I'm eager to make it over my time home. Thank you so much for sharing. I hope you have a festive Tuesday! Pork is far and above my favorite meat and I'm constantly in the mood for cranberries! This sounds delicious. What a lovely, flavorful glaze, Mary. It looks so festive and is just perfect for the season! i love fork for all the same reasons too! this looks delicious, cranberry sounds like such a perfect pair for pork! I still have a bag of cranberries in the fridge and I know this pork roast will be glazed with the cranberries! Thank you for a wonderful recipe, with flavors that I crave. I love cranberries. I made something like this last year with cherries. That's a great looking pot roast! I love the glaze. I will try this roast soon as I have some cranberry sauce leftover from Thanksgiving. This would be a really tasty way to do a pork roast! I still have cranberry sauce leftover....I see a way to use it up! Truly a thing of beauty! Wonderful! Cranberries make the prettiest sauces. I love the orange in it...and the orange liquer. A feast fo flavors and I think I'm going to do it! Wow! I don't cook pork but about "à years ago I made a cranberry-glazed turkey and every year I promise myself to make something similar. I will take your recipe, replace the pork with fowl and make it! Fabulous recipe, Mary! Hi Mary. Oh, what a wonderful giveaway! I would love you to enter my name and if I won, would get some earrings to give to my daughter.